You are here: Home / Restaurants / the one dish I could not leave Chapel Hill without..
the one dish I could not leave Chapel Hill without.. 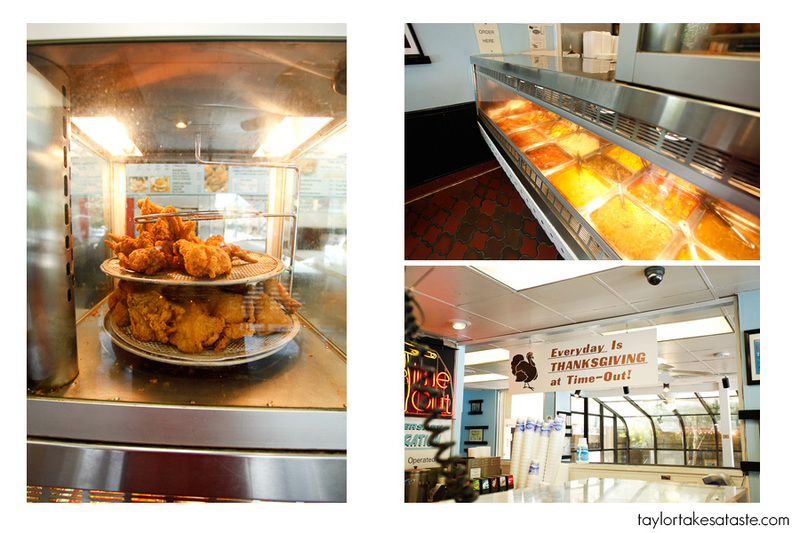 In my research of where to eat in Chapel Hill, there was one place that did not need any. You are looking at it. This is the chicken cheddar biscuit from Time Out. This dish had quite the reputation. Did it live up to it? Simply put, YES. I had seen the Chicken Cheddar Biscuit on multiple travel channel shows and had heard about it from my friends who went to UNC. This is the one dish that I had incredibly high expectations for and could not wait to eat. Before we get to the food, lets talk about where you find this dish. 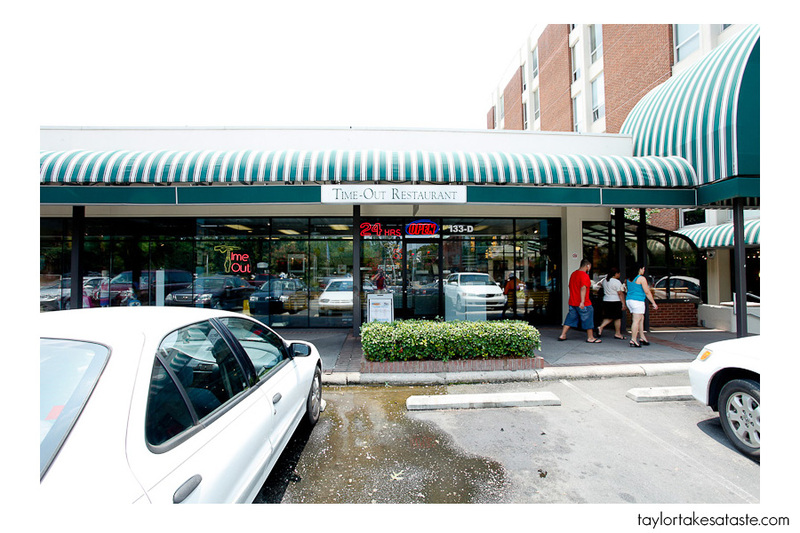 Time Out is located on Franklin St in the University Square shopping center. Just look for the building with the long green and white striped awnings about half way down Franklin street. 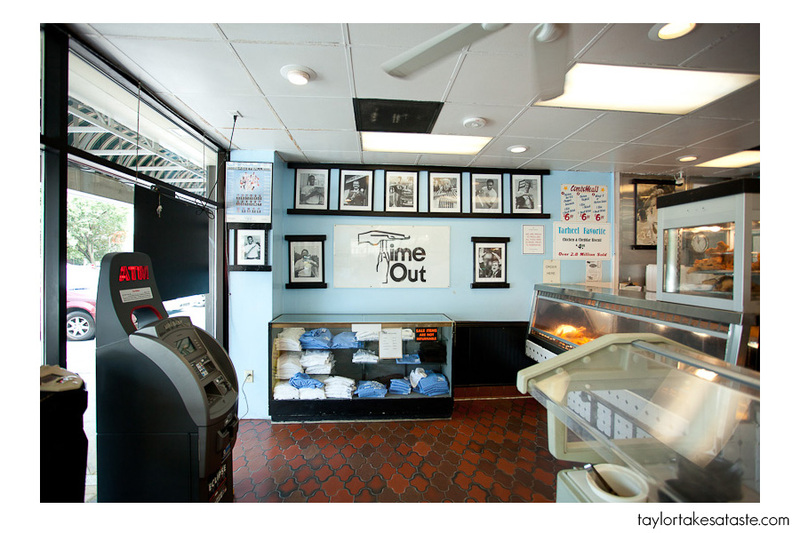 Once inside you, will quickly realize that Time Out is a Chapel Hill institution. It is open 24/7 365 days of the year. So whether it be breakfast, lunch, dinner, or late night, it does not matter. You can eat there anytime for any meal! There are pictures all over the restaurant of famous alumni doing the “timeout” sign. You can find Michael Jordan on the wall! ( remember UNC has one of the most storied college basketball programs in the country, so lots of NBA players are on the wall). Time Out’s atmosphere was about as good as it gets. 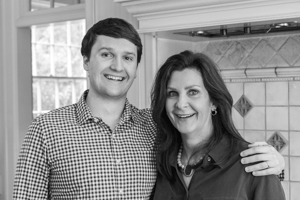 Carolina blue walls, pictures of famous alums, and awesome southern dishes. This is definitely the epitome of a college landmark restaurant. The sign is what I came for. As you can see, they have served over 2.8 million of these biscuits! Here is a view of the chicken. Look at it waiting to become a biscuit. 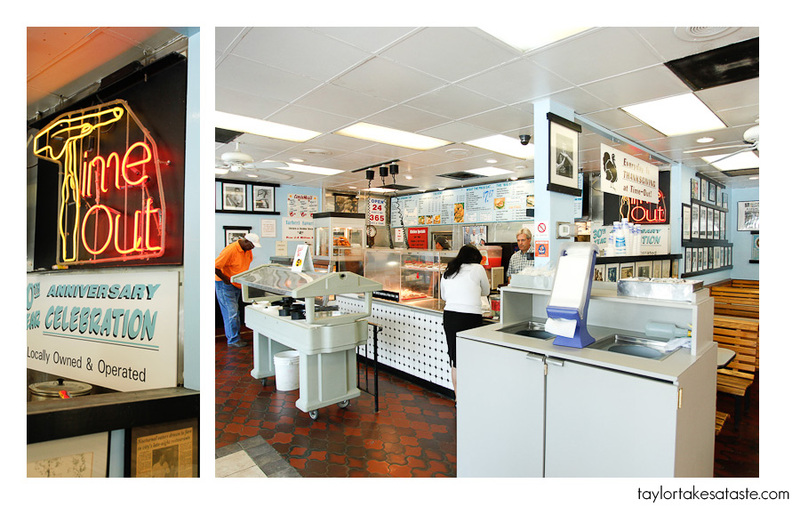 You could also order other classic southern fare. I have heard great things about the mac and cheese and fried okra. Here it is. 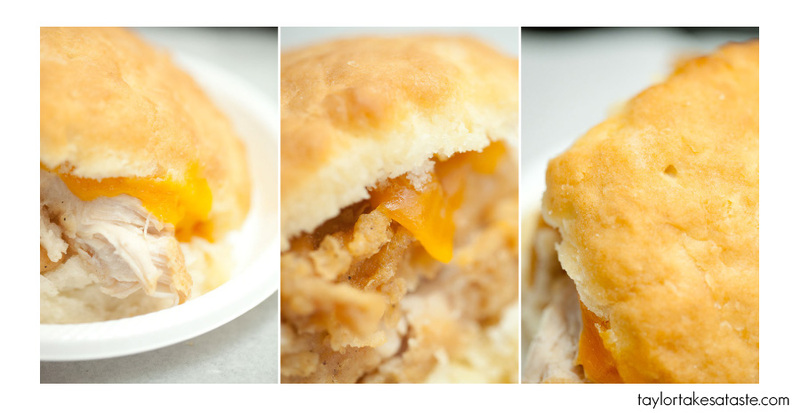 A close up of the legendary Chicken Cheddar Biscuit. Crispy skin, covering juicy and tender chicken. Topped with a slice of sharp cheddar cheese. Placed between a soft buttery made from scratch over sized biscuit. You just created a sandwich that you could sell millions! O wait, they already have. I know it sounds cliche, but this sandwich really did taste as good as it looks. It is not every day that a meal lives up to its hype. The chicken cheddar biscuit was hyped up more than any other meal I have come across. I must say it matched and possibly exceeded my expectations I can not wait to be back in Chapel Hill and have one again. 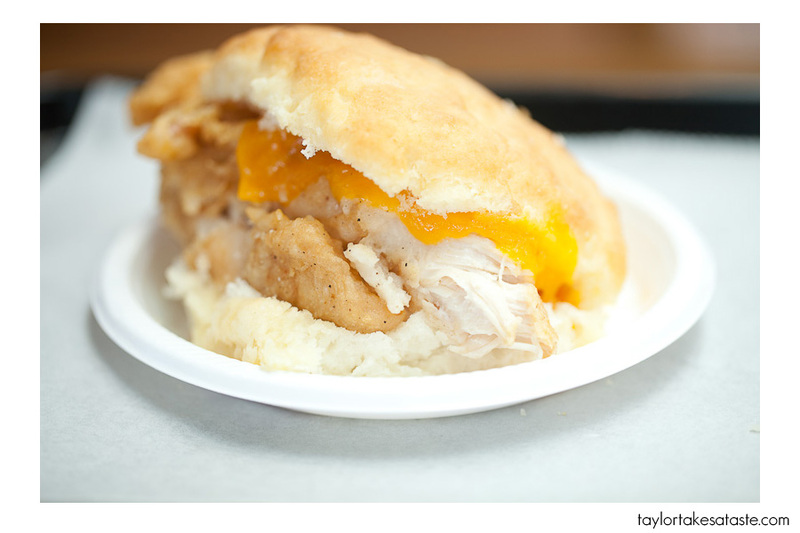 The chicken and cheddar biscuit! A classic. I think that is one of the first things I got when I was a freshman at UNC searching for late night meals. In one word: heavenly. I had the biscuit for lunch, I can’t imagine how amazing it would be late night, I would definitely get in trouble with eating too many of them. We used to wait in lines that wound around Granville to get them at 3am when the bars closed. There used to be this old black guy named Billy who worked there. He is gone now but is a legend. He would bang this old broom on the ceiling and yell at all the drunk kids. They actually have tshirts that say “chicken and cheese”. I’m hungry just thinking about it. How could a place that’s a Chapel Hill institution misspell Tar Heel? 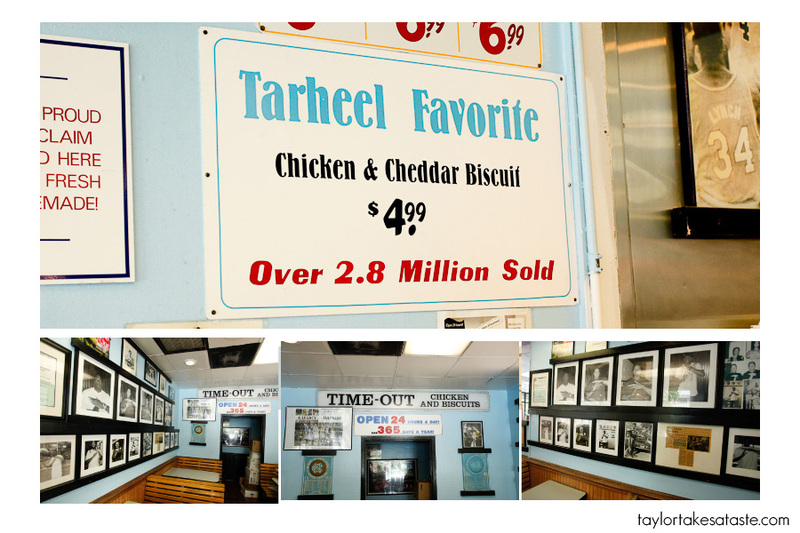 On their sign it says “Tarheel Favorite.” Anyone from NC can tell you that Tar Heel is two words. Always. OMG! i remember billy! and, speaking of going there around 3am. 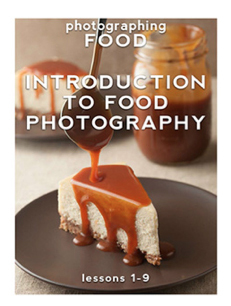 you could also order a bag of bones. that’s right – a bag of chicken bones. for the near-penniless among us following a night out drinking, a 10 cent (i think that’s what they charged in the mid-80s) bag of bones with a little meat left on ’em was just the ticket. ahhhhh.